1 in 2 people over the age of 85 has Alzheimer's disease. 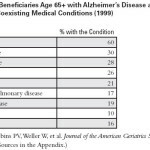 Silver Book1 in 2 people over the age of 85 has Alzheimer’s disease. 1 in 2 people over the age of 85 has Alzheimer’s disease.